We have some exciting news here at Kitchenware Direct! As a business, we have grown steadily since 2007 offering the best brands, best prices and most importantly best service when it comes to purchasing your kitchenware requirements online. To continue our ongoing growth and to best serve our customers, we needed to make a positive change – and that change is to enable our customers to shop with us not only online but also in-store. To this effect, we are combining forces with our existing retail shops,Kitchen Warehouse , Australia’s #1 in Kitchenware. This is a very exciting development and kicks off a strategy of rolling out retail stores Nationwide. So what does this mean to you the customer? You can still expect from us the best brands, best prices and best service – but you will now also be able to have the experience both online and in-store. 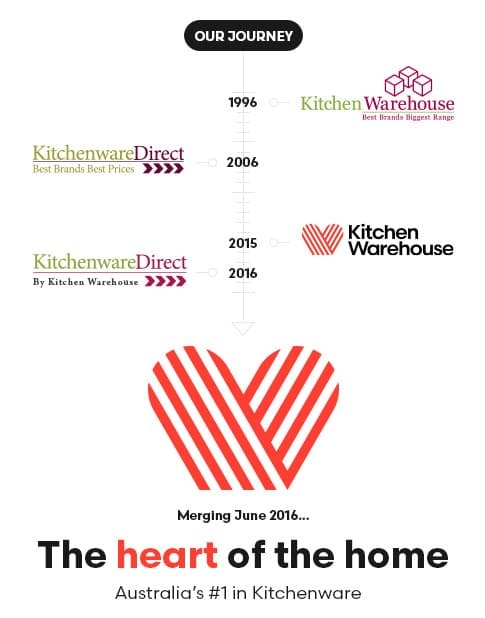 Commencing in June, Kitchenware Direct and Kitchen Warehouse will join forces and merge into a single brand, Kitchen Warehouse. It is business as usual for us. If you would like to contact us we are only a phone call or email away and we are continually committed with providing the absolute best service to all of our customers. I thank you for your ongoing support.